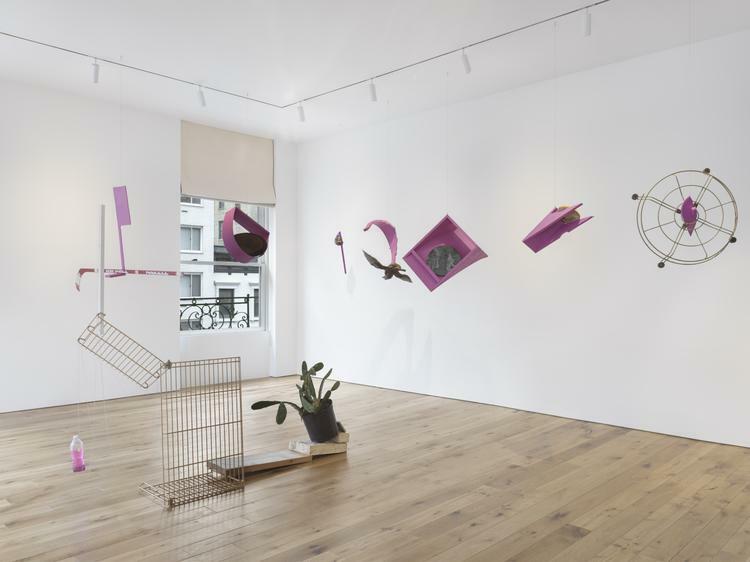 installation views of autocontusión, kurimanzutto new york, may 4 – june 22, 2018.
kurimanzutto will inaugurate its new project space in New York with an installation by Mexican artist Abraham Cruzvillegas. Opening on Thursday, May 3, 2018, the installation will feature a new iteration from Cruzvillegas’ ongoing series Autocontusión, which has been reimagined to activate the project space, incorporating locally-sourced materials from around the city. Additionally, the installation will include three new sculptures and a site-speciﬁc mural mapping the artist’s favorite locations in New York. 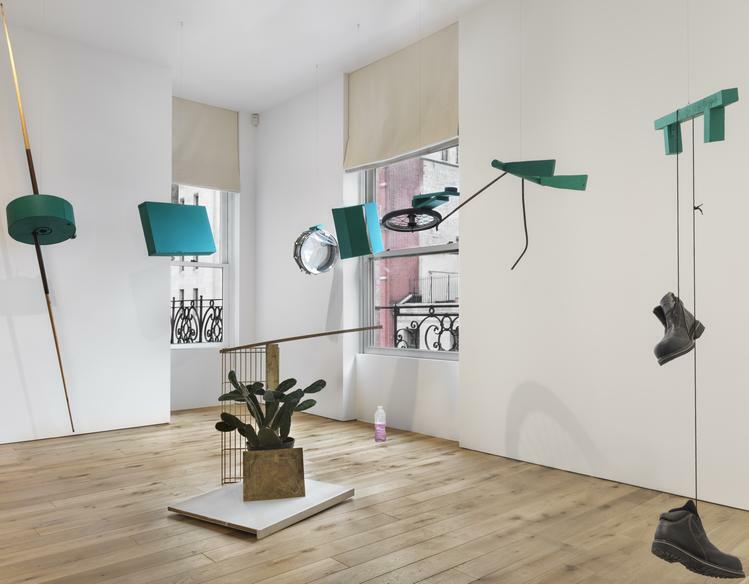 Situated on the Upper East Side on 22 East 65th Street, kurimanzutto new york represents an extension of kurimanzutto in Mexico City and will serve as a hub for a range of artist programs and projects both on-site and off, reinforcing the gallery’s collaborative and nomadic nature. 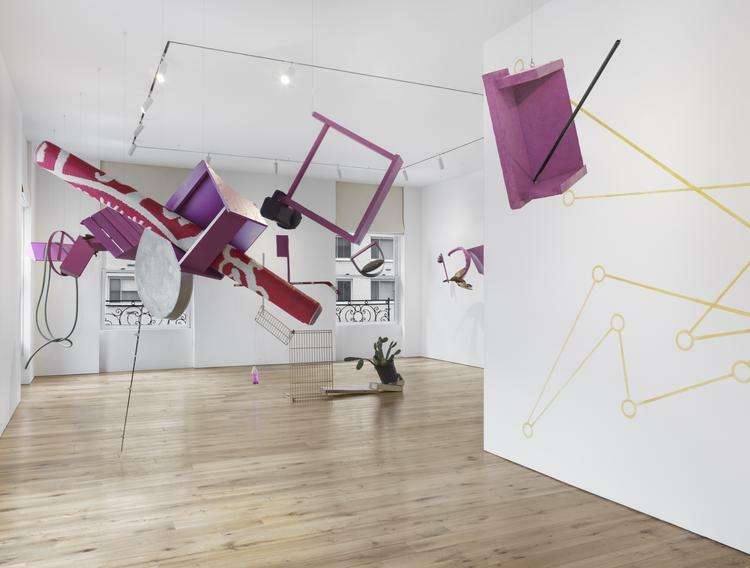 Serving as the anchor of the presentation, Autocontusión consists of a constellation of sculptures hanging from the ceiling throughout the project space. 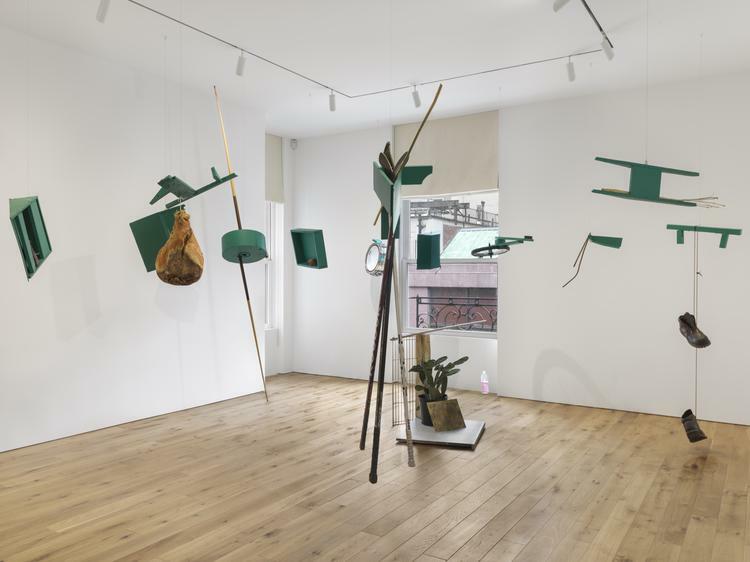 Presented ﬁrst in 2016 at Art en Valise, and then Scrap Metal Gallery in Toronto, for this installation at kurimanzutto new york, the works have been reassembled and Cruzvillegas has complemented them with locally sourced, perishable and organic elements, such as cheese, bread, turmeric, ginger, molasses, lemongrass, avocados and Italian ham, to name a few. The installation forms an hourglass shape across the space with the sculptures painted green on one half and bright pink on the other: this formal attribute is an ongoing homage to Brazilian artist Hélio Oiticica, following his visit to the Mangueria Samba Club in Rio de Janeiro in 2004. 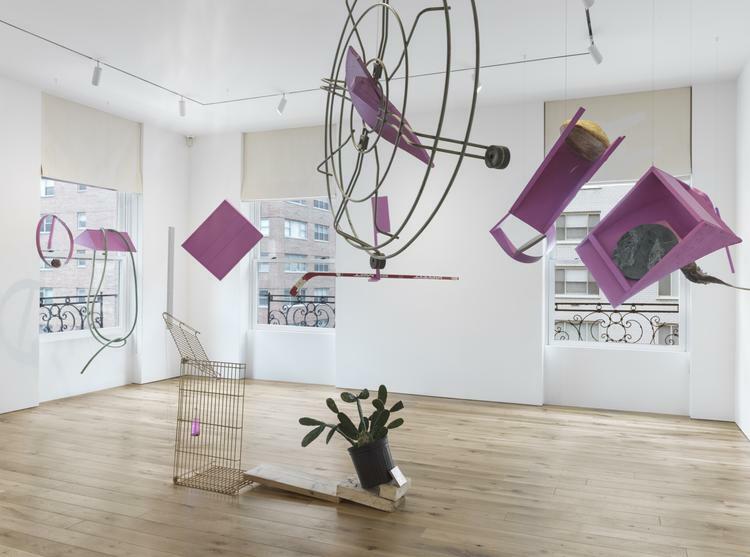 In addition to this body of work, the artist has created three sculptures comprised of metal racks and scraps, wood, silver chain, and suspended water bottles. Each bottle is ﬁlled with pink and green glass beads or chaquiras that create a colorful visual eﬀect. Interested in local fauna, Cruzvillegas also sourced native prickly pear cacti from the New York region that have been integrated into the sculptures. A site-speciﬁc mural depicting a map of lower Manhattan rendered with golden pigment complements the installation. In it, the artist creates spheres to represent some of his favorite spots (bars, bookstores, restaurants) in New York since visiting for the ﬁrst time in the 1990s. Cruzvillegas then connects the dots according to a possible route between the locations to compose an abstract, geometric shape. This map is part of a series of ongoing representations of the artist’s vibrant relationships with cities and geography, a distinctive way in which he relates to his surroundings and his own experience with changing contexts and places.